The United States Mint logged stronger sales for about 64% of its collector products. 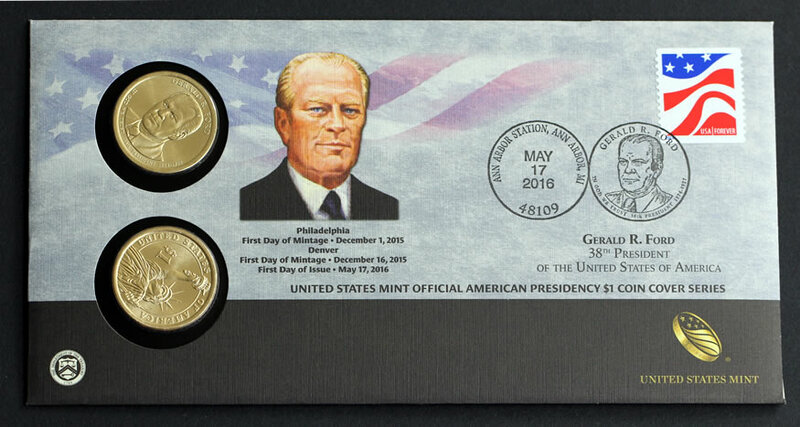 Buying activity picked up from a rather humdrum previous week, supported by releases of the 2016 Mint Set and the 2016 Gerald R. Ford $1 Coin Cover. Covers hold two circulating-quality dollars from the first day of their production. Released on May 17 for $19.95, the 2016 Ford $1 Coin Cover scored opening sales of 10,499. The immediate previous release with 2016 Nixon dollars started a bit quicker at 10,945; while the last 2015-dated issue with Johnson dollars opened a slightly slower at 10,287. 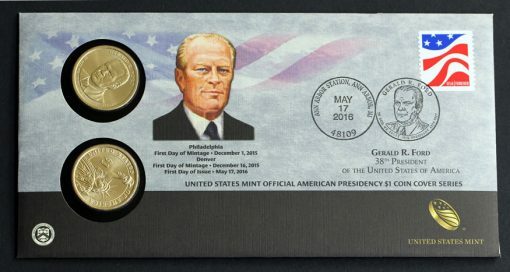 Released on May 18 for $26.95, the 2016 Mint Set with its 26 uncirculated coins debuted with sales of 127,489. Last year’s set with its 28 uncirculated coins registered an early total of 144,137, or 16,648 higher, but it also had two more days in its first reported window of sales. The following table lists opening and ending sales for sets issued since 2007. 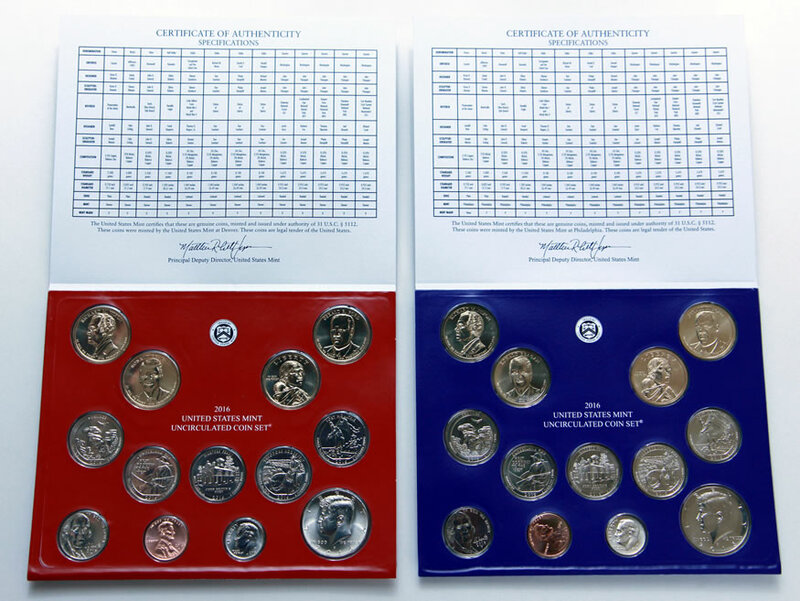 *Last year’s uncirculated 2015 Mint Set is still available, advancing 1,196 in the latest weekly sales figures. **The 2014 Mint Set has the lowest mintage since the 1961 Mint Set’s level of 223,704. The U.S. Mint published sales updates to 221 numismatic products. One hundred and thirty-nine of them outperformed their prior weekly sales compared to 60 previously. Five products increased by more than 1,000 units compared to 3 previously. Three had their sales reduced compared to 1 previously. This week’s sales report shows a fourth straight sales regression for the 2016-W Mercury Dime Centennial Gold Coin. Its total dropped 1,396 to 116,229, which is 8,701 or 7% lower than the 125,000 originally available. 2,590 to 119,920 coins for the week ended May 1. The .9999 fine 24-karat gold coin was available for about 40 minutes into its launch on April 21 before going off-sale. Mint officials have not announced when/how they will sell the remaining coins. Below are tables showing the latest sales for U.S. Mint numismatic products. The sales period covers May 16 to 22. Products with an asterisk (*) are no longer available. 8,701 Winged Liberty Head gold dimes left unsold by the US Mint. As gold drops in past 7 trading sessions. What a debacle! When the gold dimes first came out, people were paying big prices. Now you can buy an NGC SP70 for less than 280. Classic collectible bubble. third time i saw it – dimes, pepsi perfect, diecast dukes of hazzard.